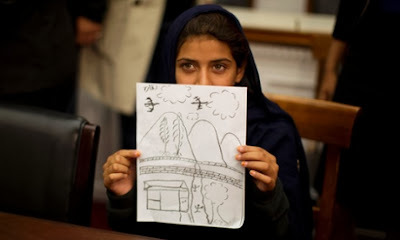 Nabila holds up a picture she drew, of the day of the attack. She is just nine. Hazel eyes, a head scarf, a set jaw line. And a story, a story that not many in the world know, or care to know. A whole year has passed since the incident happened in Nabila’s life. October 24, 2012, when the world was hailing the United Nations on the day it came into existence, Nabila’s family was shattered by the very crime that the UN has so far failed to put an end to: drone attacks. A Predator drone flew over North Waziristan that morning. Nabila was with her grandmother and her siblings, just outside their house in the village. Her grandmother was prepping the little children up for Eid, which was just around the corner. The happy family was picking out okra from the fields, as the little children learned the art from their grandmother. The drone that flew overhead buzzed about with the noise that a grand part of Pakistan’s rural population has now become accustomed to. The distinctive buzz then culminated in two loud clicks, and its payload was released. In seconds, everything changed for Nabila. Seven of her siblings were severely wounded. Her grandmother died before her eyes. She was no criminal, she wasn’t even supposed to be a target of these drones. But here she was, charred to death by the deadly payload that the remotely operated CIA drone had to offer to Nabila and her family. In rendering the translated version of the testimony, the interpreter was moved to tears. But the government? Unmoved. Ironically, the President of the United States was engaged in a meeting with Lockheed Martin, a weapons manufacturing company. Nabila just wanted to know one thing. What did my grandmother do wrong? No one has an answer. Nabila isn’t alone: hers is a narrative that is shared amply by many, many others in her village and beyond. The little girl represents the many, many narratives that the world has ignored. As nameless, faceless people push buttons in one corner of the world, more nameless, faceless people die in the name of what we claim is just war, a humanitarian cause, a global war on terror or whatever else this strange new campaign of drone attacks is called. We will write op-ed pieces, whole books and fiction. We will imagine that we can feel their pain, and we will offer band-aid legislations and hurried policy changes. But we will come right back to the same spot and make the same mistakes. We will make speeches and we will make promises: This will never happen again. We will not let our fellowmen’s passing be in vain. And yet, we will go on, letting just the opposite happen. Someone, somewhere is always affected by war. It doesn’t need to be someone you know. It doesn’t need to be someone you care about, even if you know them. But they suffer, and that suffering is as much yours as it is theirs: for you are bound by the same religion of humanity. Their wounded bodies, their broken dreams and their unachieved ambitions will stay locked in their pallid eyes. And that, like Nabila’s, is the face of war.